Che creates this spectacular custom 25'x12' art wall mural in Downtown Los Angeles. Che believes in producing art that speaks volumes to the viewer. Through his process and mural painting work across the country, his work exemplifies his love and passion for creating wall murals. It is always his endeavor to excel and deliver top-notch work in each and every one of his pieces. With wide creative range and sensitivity to each creation; Che remains at the top and serves numerous happy clients impressed with all of his custom artwork offerings. Every work of art he executes is astonishing, a creative process that will take on hues and patterns and shapes creating a narrative in the viewer's eyes. As a muralist, Che works through this process of discovery and a continual effort towards perfection, thus composing and creating one of a kind works of art. He plays with colors, textures, shapes, and movements to create excellent mural works. His paintings are a reflection of this creativity he imbibes in his subconscious and perspective. Che continues to push himself as a way to evolve and greater his creative intellect, which is proven in his mural painting and body of work. His offerings range from acrylic/oil paintings and wall murals, bringing you the complete spectrum of his talent and skill-set. Vivache Presents: THE GALLERY "An incubator for culture"
"The Heads Of Great Levitate"
When I went back to document thie installation, to my surprise the heads of great were given halos (respect) with a crossed out face and the words, "F*** Anarchist Hipster" written in silver paint! BRILLIANT! This kid (tag crew foot soilder) must have a boss and is quick to pull the trigger! Street Art & The Power of Words! Do you have the power to create change? That is the question… The answer is simple; ABSOLUTELY!!! You are the creator of your destiny, you are the master of your universe and you have the power to create anything imaginable. YOU HAVE THE POWER TO CREATE CHANGE!!! I truly believe in self empowerment and within each and everyone of us there lives is innate drive to greater our humanity and our selves. It has been over six weeks and this message continues to inspire and empower all that see it. This is a testament to what positive street art messages can add to the surrounding environment. Here is what the people have been saying. @Lindshelens, "A positve affirmation on my daily commute." @Ali_inwunderland, "Starting to warm up this city. :)"
@chizucc_huxtable, "The drive home #UPLIFT." The creation of a Street Art Gallery; on the corner of La Cienega & Jefferson there is a building that remains vacant with boarded up windows (a perfect street art gallery). This place has been a spot that I have been putting up Street Art for over 3yrs. 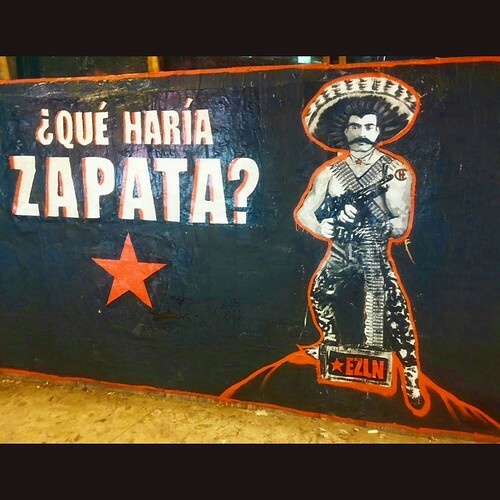 from my Freedom poster campaign to the world renowned Che-Man & now the my mixed media and hand painted works of "What Would Zapata Do?" to the famous "Marcos Eye's". 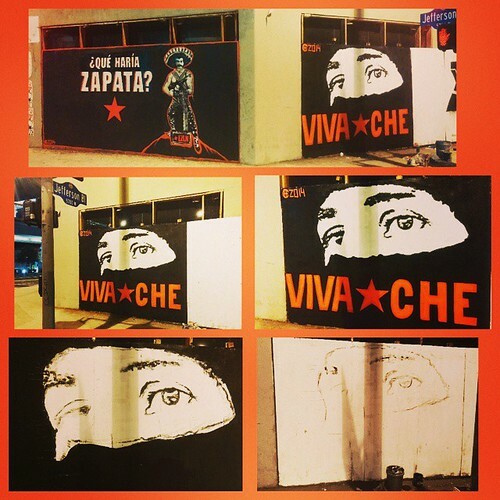 Viva-Che is intended to blend the old and the new ideas of equality and justice for all. I am the new Che and my intentions are to educate, enlighten and empower people through my imagery. At a first glance Kingston, Jamaica was very interesting, but when I began to immerse myself into the art, culture and food I realized how special Jamaica truly is. From Marcus Garvey to Bob Marley, Jamaica continues to progress through the uprising and organizing of its younger generations through direct social and cultural change. When I met Joan Webley the founder of Nanook a creative incubator in Kingston, I saw firsthand the embracing of new ideas and how they are creating social & cultural change directly. While at Nanook, I met Travis from Paint Jamaica, a creative art project which thrives off of crowd sourced funding. From the words of Travis, "Teamwork making the Dream work". Paint Jamaica has been transforming Kingston's empty walls with positive messages and giving the youth a positive creative outlet uniting a plethora of local artist. It was an honor to connect and meet all of you and I am looking forward to coming back to Jamaica for future projects! Amongst the storms of Racism, the treacherous winds of Imperialism & Fascism, and the heavy down pouring of Terrorism, rises Che-Man - provoking ideas of social change for all to see in the heart of Miami's Art District Wynwood where Art Basel is held. My goal is to take this message around the world all the way to Hong Kong and Turkey. While doing the installation in the Wynwood area around NW 24th St. and NW 5th Ave., there were several police cars in a two block radius and an army of police marching on foot like it was a war zone or training ground. Who & what are they trying to protect? Each week the popular street art blogzine Brooklyn Street Art posts a variety of images in the “Images of the Week” feature. What can be counted on in each on of these weekly features is some amazing pics from the photographic talents of BSA’s co-founder & editor of photography, Jamie Rojo. In this edition of “The Tens” we have a look at, what are in our opinion, the ten best captures over the course of the 2014 summer by Mr. Rojo. 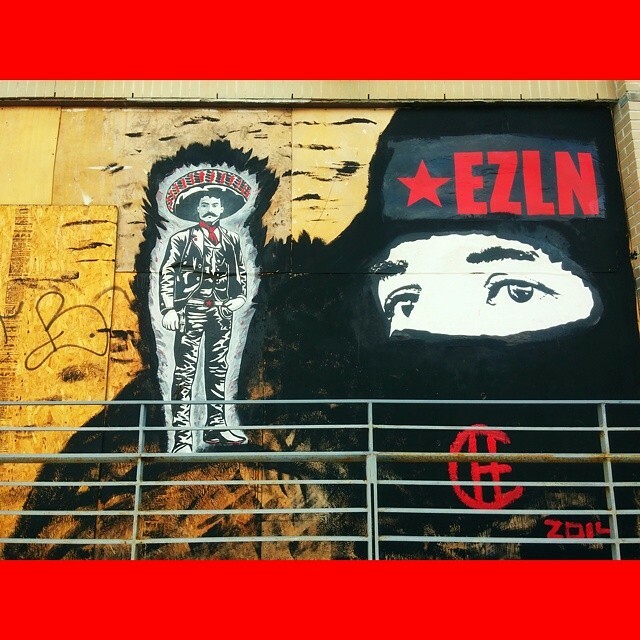 Los Angeles based artist Che picks up #2 for Che-Man & #5 for his EZLN installation in Brooklyn, NY. Che has collaborated with the Neighborhood Youth Association (NYA) this summer in a massive mural project that scaled a whole building. In his efforts to bring a mural that would visually represent the students, staff & alumni of NYA, Che started out with a focus group to gain insight on what NYA means to the community and how to communicate that on a visual level. And so it begins with the "NYA Tree of Knowledge". NYA builds a safe and secure environment where the kids eat that fruit of knowledge from the tree that helps to empower them. As they swing off into the sunset over the flourishing community gardens, NYA youth begin their journey down the path of curiosity and enlightenment. They capture books to gain the strength of knowledge, while embracing the power of education. All of this is because NYA helps to build an everlasting community bond while encouraging the "TOGETHER WE SUCCEED" mentality. As they hold one another up and celebrate the achievement of their educational goals, students and community can celebrate in the attainment of the ultimate Golden Diploma. The cycle of success, leadership and education achievement continues as the seed of NYA is replanted. The final panel depicts the massive pivotal journey of NYA students: a week-long self-realization trip to Yosemite National Park where they reconnect with nature and look forward to the future and all of the endless possibilities through life's binoculars! Che-Man contiues to spread his message. "Each ghost represents a specific “isms”: Racism, Imperialism, Fascism and Terrorism. Now take a minute and ask yourself and imagine, what if these “isms” did not exist in our society? How far more advanced would we be as a civilization?" 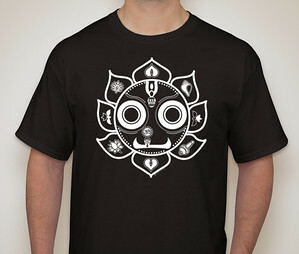 Fresh Jagannath Tee inspired by Street Art Tapestry. 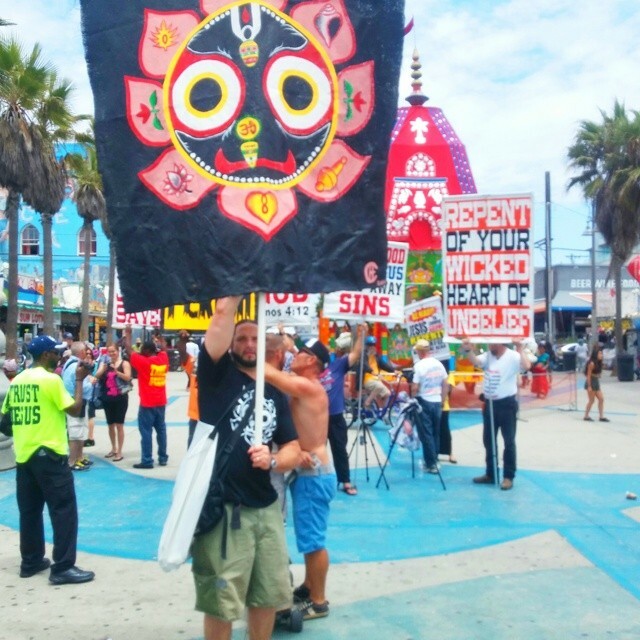 Jagannath Street Art Tapestry goes to Venice Beach for the Festival of Chariots! 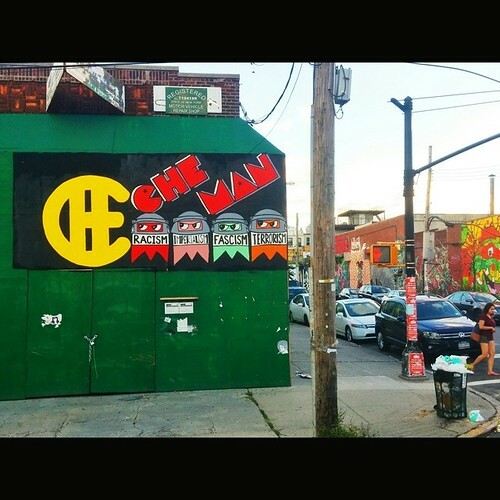 Che-Man hits up the Bushwick Collective in Brooklyn. 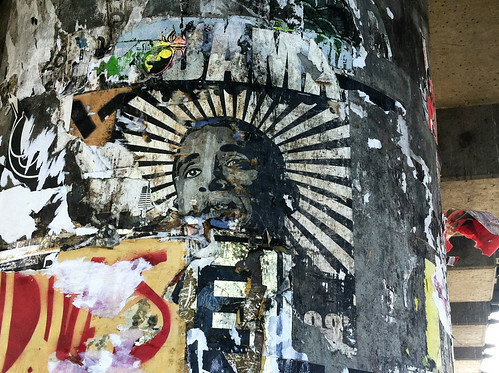 The Bushwick area has been transforming into a major street art scene in NYC. Only up for a short period (two days), this particular building and its green wall is owned by CMM VENTURES HOLDINGS LLC and Jacob Sacks, which seemingly do not agree with the idea of a World free from Racism, Imperialism, Fascism and Terrorism. 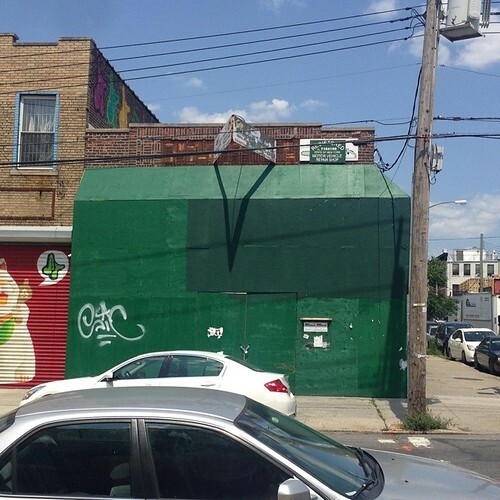 Also, there is no alignment with the Bushwick Collective's mission of creating a thriving, vibrant and visual pleasing environment through the use of street art. It is to bad that they are not willing to embrace Art given their location! 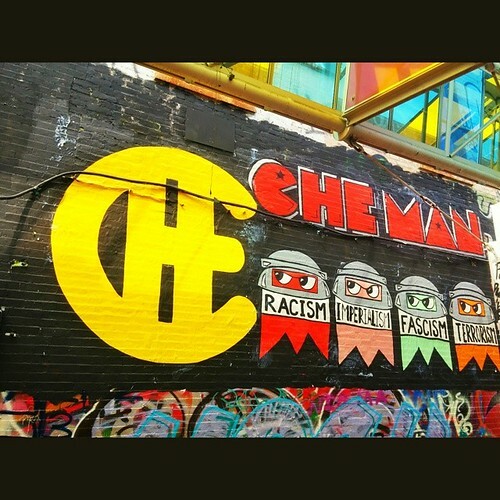 Che-Man in heart of The Bushwick Collective in Brooklyn! There is no doubt that the Bushwick in Brooklyn continues to thrive, pushing the barriers of Street Art, but only when you visit this place you will truly grasp why Artists gravitate here. It houses a massive artist building (The Troutman Artist Building), so naturally you have a huge creative supportive backing, plus you have The Bushwick Collective and its creator Joe Ficalora, finding empty walls and artists to fill them. Che-Man goes to Modica Way AKA: Graffiti Alley in Cambridge. With many praises from the locals and help from the surrounding businesses, the Che-Man Street Art installation was a success. 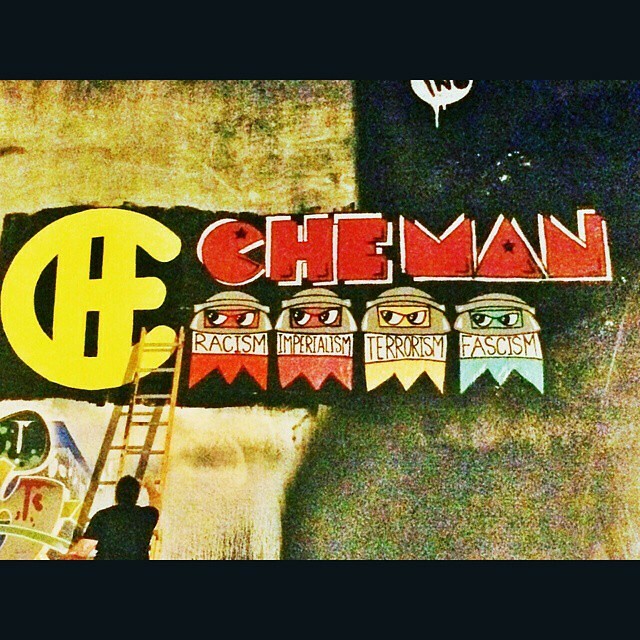 Che-Man hits up the Art District (18b) in Las Vegas on 1025 1st. Street behind the Brett Wesley Gallery. 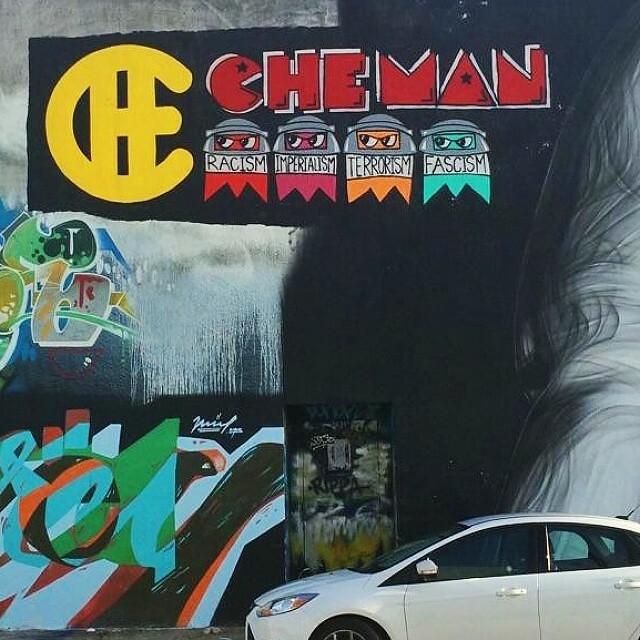 Che-Man goes to SF's Mission District and Downtown Oakland. Che-Man’s purpose is it to create awareness of these four “isms” that are the causations of oppression. Racism- a belief or doctrine that inherent differences among the various human races determine cultural or individual achievement, usually involving the idea that one’s own race is superior and has the right to rule others. A policy, system of government, etc., based upon or fostering such a doctrine; discrimination. Hatred or intolerance of another race or other races. Imperialism- a policy or practice by which a country increases its power by gaining control over other areas of the world and the effect that a powerful country or group of countries has in changing or influencing the way people live in other, poorer countries. Fascism- a way of organizing a society in which a government ruled by a dictator controls the lives of the people and in which people are not allowed to disagree with the government and very harsh control or authority. Terrorism- the use of violent acts to frighten the people in an area as a way of trying to achieve a political goal. To directly impact and change a social norm we must educate each other on the implications that these “isms”. And we must openly dialogue on how they have affected our lives directly and indirectly. By creating a RIFT in the social paradigm, we are forced to deal with these issues. Humanity’s future is dependent upon educating our youth and creating young strong leaders. The goal of my campaign is to educate and create a call to action for our youth and society at large. 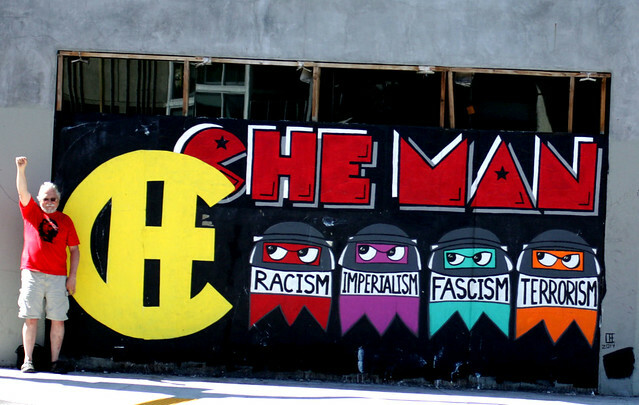 Che-Man stems from a multitude of ideas and is a social commentary of what is happening throughout the world. You may have noticed that Che-Man is similar to the famous arcade game “Pac-Man”, this reference was appropriate because of the familiarity we have to Pac-Man as a culture. The ghosts are fitted with police issued riot gear, reminiscent of the police in Turkey & Brazil targeted at non-violent protesters. In Turkey 11 people were killed and more than 8,000 were injured, many critically. Each ghost represents a specific “isms”: Racism, Imperialism, Fascism and Terrorism. Now take a minute and ask yourself and imagine, what if these “isms” did not exist in our society? How far more advanced would we be as a civilization? By taking the first letters of these “isms”, the word RIFT is created. Let’s unite and create a RIFT! Watch how Che transforms Intrepid Athletics in his latest video. As you know by now Michael "Che" Romero AKA: The CrossFit Artist has been teaming up with CrossFit Gyms through out the Greater Los Angeles Area to add even more life to their spaces, where all types of athletes, young and old, workout till exhaustion and literally drown in their own sweat. From CrossFit Means Streets of DTLA, Trojan CrossFit in the Arts District to Culver City CrossFit. Che has been on a rampage, painting empty walls and creating huge murals that help build these gym's community and brand presence. 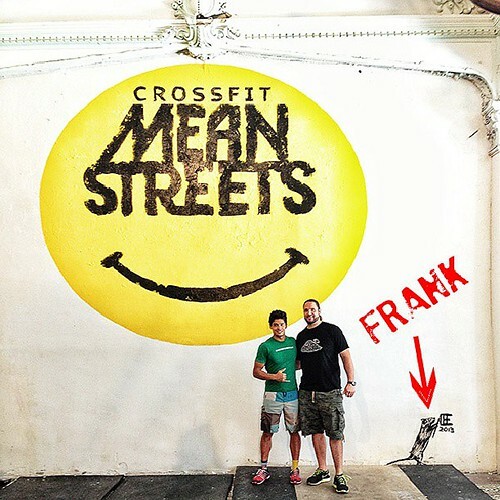 (Above) Che himself with owner Ronnie Teasdale of CrossFit Mean Streets and now famous Frank the #meanstreetsrat. "I had a vision of using some sort of smiley as a logo for over a year now. A couple of weeks ago artist Michael "Che" Romero concluded my vision with this concept. He has been putting up paint in CrossFit gyms and he exceeded my expectations totally and he is one of the coolest guys I have met" -Ronnie Teasdale. Underground Pop-Up Show was a success. Over 300 in attendance. Thank you all for your support. Till next time. See you all at the show in July!!! Print release coming soon. Check out the shop to see latest prints. Pop-up Street Art Show in April. Follow me @cherula to be added to the RSVP list for the show. Happy New Year to you all and looking forward to seeing you at my next show. A mind that does not wonder, dream, think and question is a mind that has been washed of substance and intellect. 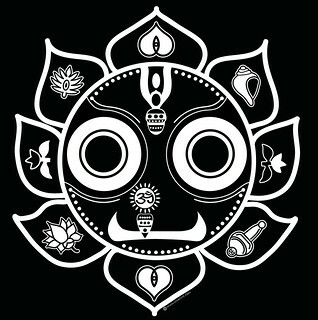 Sloth is the avoidance of mental, physical or spiritual work. Sloth to me is the avoidance of understanding one's self. People need to know that consumerism and materialism are not who we are. American Culture teaches us to accept this form of behavior, through the means of mass media propaganda and misinformation from television and news. We as Americans have been brain washed through these means and our minds are filled with negativism, sexism, greed, and selfish ideas that oppress our minds from reaching full consciousness. 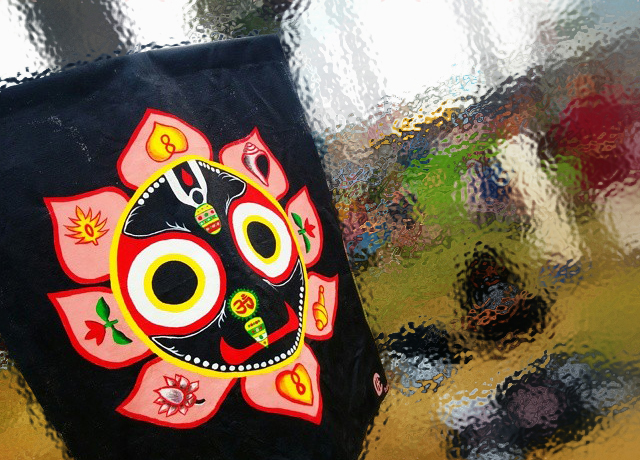 Shed the material world for a moment and enter mine.